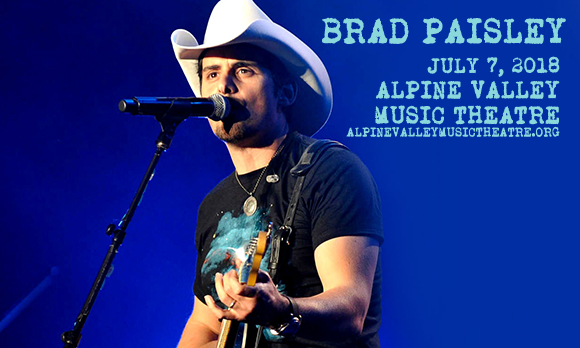 It's the country event of the year, as Brad Paisley comes to Alpine Valley Music Theatre on Saturday 7th July 2018! The multi-platinum-selling, Grammy Award-winning artist will be tearing up the stage as part of his extended Weekend Warrior World Tour, bringing the party with him, as well as fellow country stars Hank Williams Jr. & Dan Tyminski! Brad Paisley has come a long way since his first foray into the country scene. Paisley's debut release, the 1999 album Who Needs Pictures, was well received both critically and commercially, scoring him four top-ten singles on the Billboard country music charts (including two number ones). Two years later, he was inducted as the youngest ever member of the Grand Ole Oprey. Over the years, Paisley has sold over 12 million albums and has recorded ten studio albums to date, as well as a Christmas album, with each receiving gold status or above from the RIAA. He also holds the record for the most consecutive number one singles on the Billboard Hot Country Songs chart (ten) and he has scored thirty two top ten singles in the chart, including eighteen number ones. Paisley is also a highly-awarded artist, having won three Grammy Awards, fourteen Academy of Country Music Awards, fourteen Country Music Association Awards, and two American Music Awards to date.